Post-traumatic stress disorder increasingly afflicts veterans of modern warfare. The New England Journal of Medicine (July 2005) reports, that it affects almost 20% of soldiers returning from Iraq. Tragically, PTSD impacts all aspects of life. Some vets can't hold jobs or sustain relationships. Others have recurrent nightmares or won't leave home, fearing they may attack 'the enemy' seen in the faces of those they meet. To begin healing, says Edward Tick, we must see PTSD as a disorder of identity itself. War's violence can cause the very Soul to flee and be lost for life. Drawing on history, mythology, and thirty years of experience, Dr. Tick reveals the universal dimensions of veteran's Soul wounding. 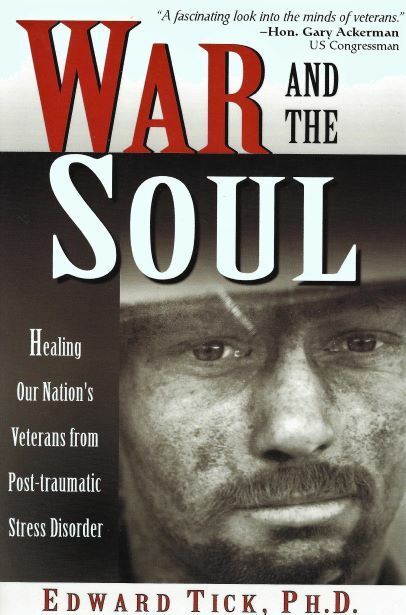 He uses methods from ancient Greek, Native American, Vietnamese, and other traditions to restore the Soul so that the veteran can, at last, truly return home. His work is invaluable for veterans of any war as well as for their families and all, who would help them.
" Our goal is not just to awaken the Soul; that is what childhood, religious and secular education is meant to do. Rather, our goal is to 'grow' the Soul large enough, to help it become wise and strong enough, so that it can surround the dominating wound we call trauma. When we do this, PTSD can evaporate and we can have people like Mr. Tiger, devoted to the peaceful cultivation of the earth and to international friendship and reconciliation. The formula for the war-wounded Soul is simple: surround trauma with Soul. Its application may be the most difficult and important work we ever undertake. "